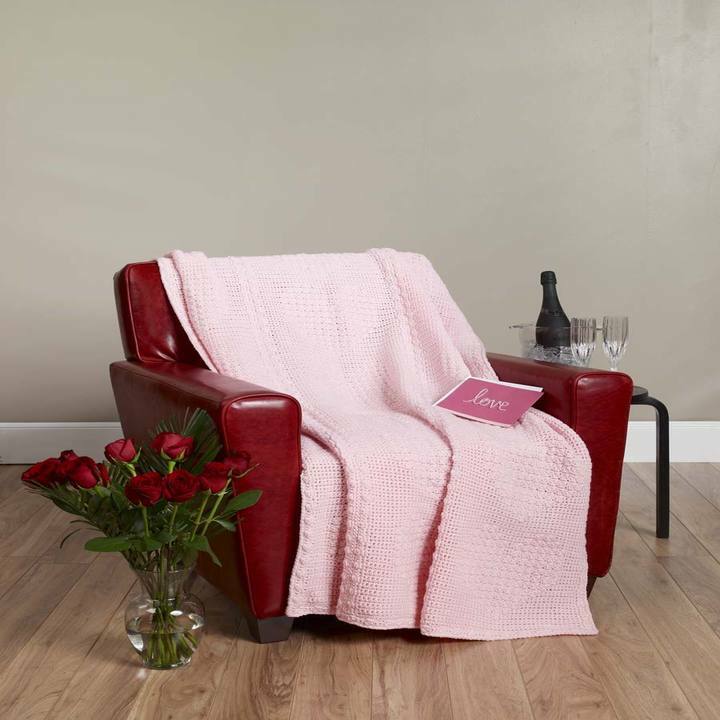 Crocheted in delicate baby pink with a heart design, this afghan says “Sweetheart”. Any little girl (or not-so-little girl) who loves pink will want to take it with her everywhere, and that’s okay because Red Heart® Super Saver® makes it easy care. GAUGE: 12 sts = 4″; 12 rows = 4″ in pat; panel = 13″ wide before edging. CHECK YOUR GAUGE. Use any size hook to obtain the gauge. 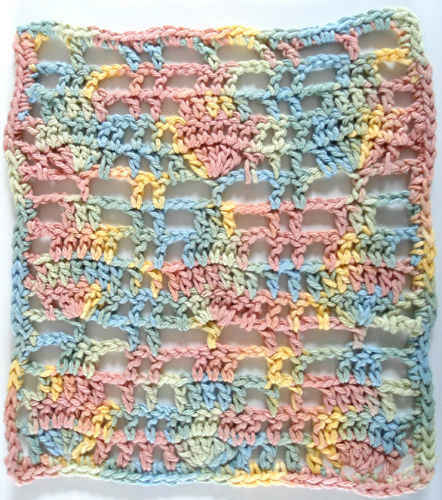 Afghan measures approximately 45″ x 58″. CL (cluster) = [yo and draw up a lp, yo and draw through 2 lps on hook] twice all in next st, yo and draw through all 3 lps on hook. PANEL (Make 3): Ch 40. Row 1 (Right Side): Sc in 2nd ch from hook and in each ch across; turn –39 sc. Rows 2-5: Ch 1, sc in each st across; turn. Row 6: Ch 1, sc in first 19 sc, CL in next sc, sc in last 19 sc; turn. Row 7 AND EVERY RIGHT SIDE ROW: Rep Row 2. Row 8: Ch 1, sc in first 17 sc, [CL in next sc, sc in next sc] 3 times, sc in each sc to end; turn. Row 10: Ch 1, sc in first 15 sc, [CL in next sc, sc in next sc] 5 times, sc in each sc to end; turn. Row 12: Ch 1, sc in first 13 sc, [CL in next sc, sc in next sc] 7 times, sc in each sc to end; turn. Row 14: Ch 1, sc in first 11 sc, [CL in next sc, sc in next sc] 9 times, sc in each sc to end; turn. Row 16: Ch 1, sc in first 9 sc, [CL in next sc, sc in next sc] 11 times, sc in each sc to end; turn. Rows 18, 20, 22: Ch 1, sc in first 7 sc, [CL in next sc, sc in next sc] 13 times, sc in each sc to end; turn. Rows 24, 26: Ch 1, sc in first 7 sc, [CL in next sc, sc in next sc] 6 times, sc in next 2 sc, [CL in next sc, sc in next sc] 6 times, sc in each sc to end; turn. Row 28: Ch 1, sc in first 9 sc, [CL in next sc, sc in next sc] 4 times, sc in next 6 sc, [CL in next sc, sc in next sc] 4 times, sc in each sc to end; turn. Row 30: Ch 1, sc in first 11 sc, [CL in next sc, sc in next sc] twice, sc in next 10 sc, [CL in next sc, sc in next sc] twice, sc in each sc to end; turn. Rows 31-35: Ch 1, sc in each sc across; turn. Rep Rows 6-35 five more times. Fasten off. Row 1: With right side facing, attach yarn to work across long edge; ch 1, sc in each row end across; turn. Row 2: Ch 1, sc in first 2 sc, CL in next sc, * sc in next 3 sc, CL in next sc; rep from * to last 2 sc; sc in last 2 sc; turn. Row 3: Ch 1, sc in each st across. Fasten off. Sew or sl st panels together, being careful that the far right and far left edges of the afghan do not have edging. Border-Rnd 1: With right side facing, attach yarn to work across top edge; ch 1, 2 sc in corner, sc in each sc and each joining across to next corner, 3 sc in corner, skip first row, sc in each row end to last row, skip last row, 3 sc in corner, sc in each sc and each joining across to next corner, 3 sc in corner, skip first row, sc in each row end to last row, skip last row, 1 more sc in first corner; join with a sl st to first sc; TURN. Rnd 2: Ch 1, sc in same sc as joining, ** sc in next 2 sc, Cl in next sc, * sc in next 3 sc, CL in next sc; rep from * to 2 sc before the center corner sc; sc in next 2 sc, 3 sc in corner sc; rep from ** around; join; turn. Rnd 3: Ch 1, sc in each st around and 3 sc in center corner sc; join; do NOT turn. Rnd 4: Ch 1, sc in each sc across top and bottom edges and sl st in each sc across side edges, increase as necessary at corners; join. Fasten off. Weave in ends. 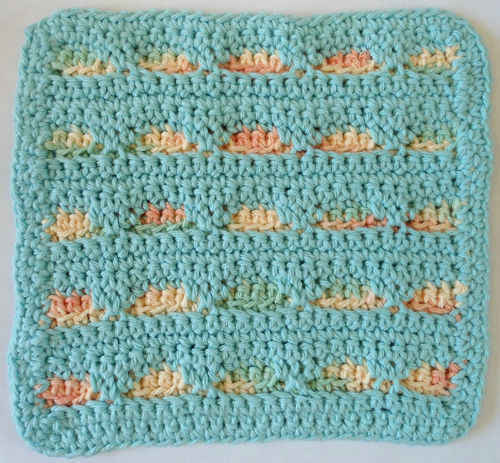 ABBREVIATIONS: ch = chain; lp = loop; mm = millimeters; pat = pattern; rep = repeat; rnd = round; sc = single crochet; st(s) = stitch (es); yo = yarn over; * or ** = repeat whatever follows the * or ** as indicated;  = work directions in brackets the number of times indicated.